Coming off of yesterday's post and the potential goodness that blue M&Ms can provide, I thought I'd share with you all some love about my current favorite little round blue comestible - the blueberry. I have loved blueberries since I was a little kid, when my father had a blueberry bush growing behind my childhood home. It was a yearly tradition for us to help him pick blueberries, and our spoils from the event would be 10+ plastic containers filled to the brim with the delicious little guys. We'd put most of them in the freezer, and as a result, all year round we could enjoy blueberries in our pancakes, muffins, cobblers, or just as an afternoon snack. It was paradisical. 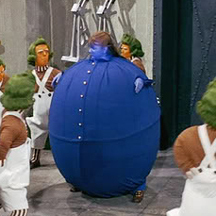 Considering my love for blueberries at the time, I'm somewhat surprised I didn't end up turning into one, a la Violet Beaureguarde in Charlie and the Chocolate Factory. I guess my lack of a gum fetish saved me on that one. It's been years since we moved away from that home (and subsequently that blueberry bush), but I'm happy to report that blueberries are back as my current favorite fruit obsession. Now that they're in season (and cheap! ), I have been buying about two cartons a week, and I am totally okay with the fact that I crush the contents within a matter of days. Can you blame me? They are delicious, they are adorable, and the health benefits are off the charts! Blueberries have one of the highest antioxidant concentrations of any fruit? Antioxidants boost your immune system and prevent you from getting sick. They also keep you feeling in tip-top shape from head to toe. And that is a great way to feel! Blueberries can keep your brain healthy and strong? Tons of the nutrients - like vitamins A, B, C, and E, manganese, zinc, and more - are associated with healthy brains. 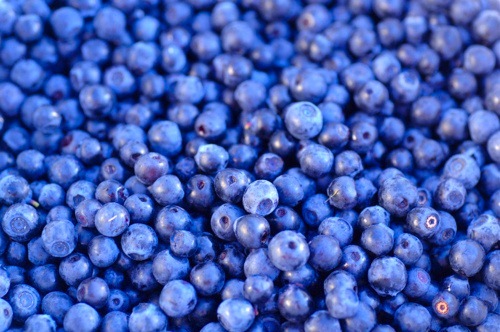 There are even studies being conducted associating blueberries as a cure for Alzheimers - pretty awesome! In addition, blueberries are believed to help keep your memory going, so pop a few and then try your hand at a good old round of Simon. Blueberries can keep your heart healthy and strong, too? Blueberries are packed with fiber, antioxidants, and cholesterol-lowering agents - all crucial for keeping your heart beating beautifully. They have also been known in studies to help fortify the cells in the heart's blood vessel walls, and to keep blood pressure at healthy levels. Bump-bump, bump-bump! Blueberries are a natural anti-carcinogen? They have also been shown to help those currently suffering from cancer by stunting the growth of cancerous cells. Blueberries potentially could reduce belly fat? Some fad diets of the past recommended eliminating fruit since the fructose (a form of sugar) was thought to make people gain weight, instead of losing it. I'm so glad that blueberries (among other fruits) are finally touting as a good healthy diet tool, instead of a harmful one. All of these facts come from research garnered from World's Healthiest Foods: "Blueberries" and WomenFitness.net's "Top 10 Health Benefits of Blueberries." There are even more health benefits to blueberries than what I listed above, so I strongly recommend checking these two sites out to learn more! So, as you can see - blueberries are a powerful food. And a mad tasty one at that - so pick up a carton today, and enjoy them with me! If I keep this up, you might start having to call me Violet Beaureguarde. Or maybe Bizzy the Blueberry. I don't know, it kind of has a nice ring to it. Coincidentally, I am currently enjoying a "Blueberry" flavor beer. The brand is "Sea Dog"
If you can find one, I highly recommend it. Most beers that have fruit flavors usually aren't that good or are too sweet, but this one is just right.